Disease-ridden salmon farming is a sickness spreading all over the globe! Local communities across Scotland are rising up against the "carpet-bombing" of the West coast by Norwegian-owned salmon farming corporations. On the Isle of Skye in the Western Isles, a new group called Skye Waters Against Fish Farming (SWAFF) was officially launched this week at a public meeting in Armadale (8 November) to fight Marine Harvest's plan for a super-sized salmon farm in Loch Slapin. "Fourteen more salmon farms, and big ones too, is going to have an enormous impact," said Arthur Sevestre speaking in front of a Marine Harvest farm. "We're setting up this group Skye Waters Against Fish Farming which will be about the local issue. But we're recognizing that if we keep this one farm from being built the problem is far from over. They'll just go somewhere else." "They're basically carpet-bombing the whole area - not just Skye but the whole of West Scotland," continued Sevestre. "Win one local battle and you're nowhere. This has to be a Skye thing, or a Scottish thing or a global thing." Wild salmon advocates are also raising a stink about sea lice infestation on salmon farms on Skye and elsewhere on the West coast of Scotland. Derek Dowsett of Three Esses Ltd is involved with the Skye Fisheries Trust in protecting wild salmon on the Isle of Skye. "It''s hard to imagine a Scottish river without salmon in it," he said in an interview yesterday (9 November) on the banks of the River Snizort. "The Government is making efforts to regulate sea lice infestations on fish farms. In order to do that you either get lucky and don't have a sea lice problem which many farms will tell you they don't have or you spend an awful lot of time and money treating your fish with antibiotics, even peroxides, to keep the lice counts down." "The infestations can often depend on the water flow under the farms, the draught that you have under the cages, and all kinds of reasons but they have to be controlled," continued Dowsett who is the leaseholder of the River Snizort, Skye's premiere salmon river. "Sea trout particularly suffer from sea lice." "There's plenty of documentation on how sea trout populations all over Scotland have dipped and there's a great deal of evidence to link those with infestations on concentrations of fish in sea farms," concluded Dowsett. Watch the interview with Derek Dowsett in full via "Wild salmon of Scotland need protecting"
"With Marine Harvest doing business in over 20 countries and other salmon farming companies following suit, there is good reason to be concerned," said Elena Edwards of Wild Salmon First who is visiting from British Columbia. "Canada, Scotland, Ireland, New Zealand, Chile; all have a lot to lose at the feet of this industrial corporate giant, with wild fish stocks the greatest loss of all." "Wild salmon and farmed salmon cannot co-exist without the risk of disease & parasite outbreaks transferring from farmed to wild salmon," continued Edwards. "The only solution is for salmon farms to get out of our global oceans. As governments are being bought off by salmon farming industries the world over, it is now up to citizens concerned about the protection of wild salmon, marine habitat and the environment to join together and speak up for all that will be lost to salmon farming." The local newspaper, the West Highland Free Press, reported (2 November) on the "overwhelming opposition" to plans by Marine Harvest (owned by Norwegian billionnaire John Fredriksen) to expand on the Isle of Skye. Read more via "Strong Opposition to Plans for Loch Slapin Fish Farm"
Kurt Oddekalv, leader of the Green Warriors of Norway, has joined forces to fight the expansion of Norwegian-owned salmon farming companies across Scotland. 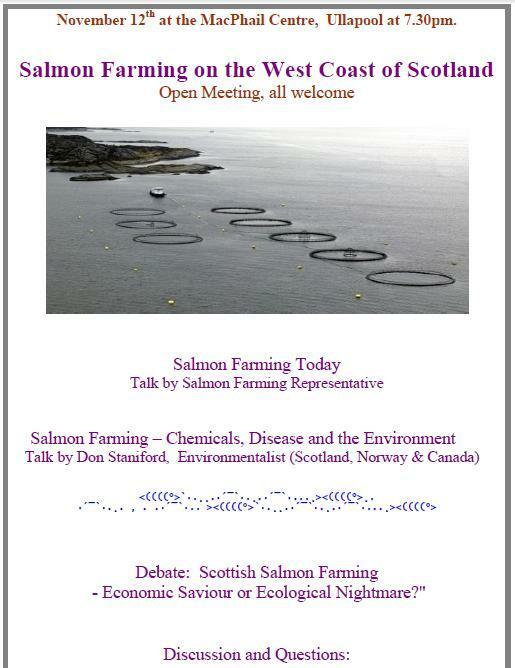 Speaking at the public meeting in Armadale (8 November) he told the Marine Harvest staff in attendance that salmon farming was infested with sea lice, spread infectious diseases and untreated waste and needed to clean up its act. Kurt Oddekalv, along with many other concerned locals signed the Declaration for Wild Salmon which will be brought to Norway next year. Read more via "Flying the Flag for Wild Salmon in Scotland & Ireland"
"This is cowboy salmon farming country," said Don Staniford during a tour of salmon farms yesterday (9 November). "The West coast of Scotland is like the Wild West without a sherrif. The Scottish Government and the Scottish Environment Protection Agency have cravenly kowtowed to Norwegian multinationals who are being allowed to expand without proper protection or policing." Arthur Sevestre of Skye Waters Against Fish Farming (SWAFF) accompanied by Elena Edwards of Wild Salmon First also visited Skye's Member of the Scottish Parliament yesterday (9 November) in Portee. Dave Thompson, Member of the Scottish Parliament for Skye, Lochaber and Badenoch, listened carefully to the concerns raised about sea lice infestations on salmon farms on Skye and in Loch Slapin in particular. Following the meeting, the local Member of the Scottish Parliament, pledged to write a letter to the First Minister of Scotland, Alex Salmond, and ask a Parliamentary Question on the sea lice issue on Skye. Hopefully the Scottish National Party, the ruling party in Scotland, will listen to the concerns raised by Skye Waters Against Fish Farming (SWAFF). Kurt Oddekalv, leader of the Green Warriors of Norway, also visited Highland Council's office to deliver two damning reports on the state of salmon farming in Norway. Read the report online via "Norway's Salmon Shame"
The lasting impression from the Isle of Skye is a stomach-churning one - salmon farming stinks! Read more via "Outer Hebrides Against Fish Farms"
For a full itinerary read online here and watch our regular video updates online here. The Scottish salmon farming industry is reeling from a new scientific paper published this week (7 November) by the Royal Society. "In a joint statement, the Association of Salmon Fishery Boards and the Rivers And Fishery Trusts of Scotland welcomed the research. The statement added: "In some circumstances and in some locations, sea lice arising from farmed fish can have a highly significant impact on wild salmon. Indeed, over the last 20 years there has been no substantive evidence to counter the hypothesis that sea lice arising from aquaculture cages harm wild salmon." Easter Egg Ban for 'Scottish' Salmon? Mail On Sunday: "Sir David: Fish farms may kill all wild salmon"
BBC News: "Sea lice blamed for major fall in salmon tonnage"
Press Release: "The Sorry State of Scottish Salmon Farming in 2018"
New Report - "The State of Scottish Salmon Farming in 2018"
Rising Up Against Farmed Salmon - Chefs, Fishermen, Celebrities & Concerned Citizens Take the Pledge!